Our garbage disposal threw its hands up and surrendered to the land of broken appliances. We fought it for awhile, clinging to the hope that our dear friend would stay with us. But, its conviction was strong and we’ve had to say goodbye. It’s funny, because I never had a garbage disposal growing up, yet I’ve somehow become so very attached to the one in our home that I hardly know how to function in the kitchen without it. A new, super monster of a disposal is waiting to be installed, but in the mean time, we’ve been learning to throw our scraps in the garbage. 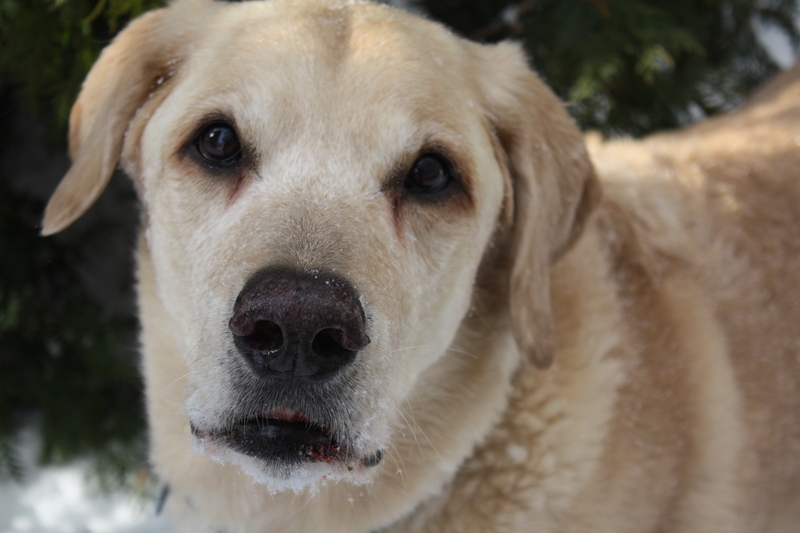 No one has benefited more from the broken garbage disposal than our giant labrador disposal. We do not feed him people food. No, he just helps himself. And so, during he night, while the rest of the family is sleeping, our labrador sticks his giant head into the garbage bag and enjoys a midnight snack. 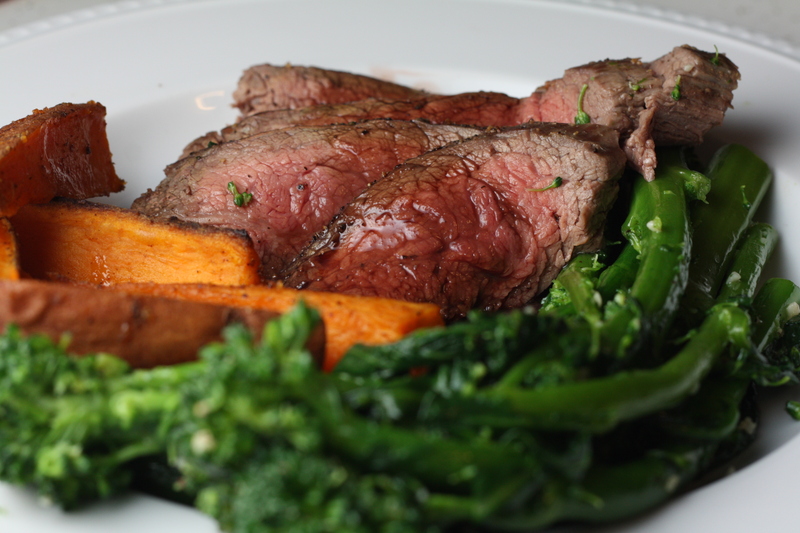 His most recent snack included tender pieces of broiled flank steak drizzled with a pomegranate balsamic reduction and served with garlic-sauteed broccoletti and roasted sweet potato wedges. He greeted me in the morning with the enthusiastic tail wags of gratitude. P.S. Humans will also enjoy this tasty meal. Preheat broiler. Season the steak with a generous amount of salt and pepper. Place it on a baking sheet and broil a few inches below the broiler, for 10-15 minutes, depending on your desired doneness. 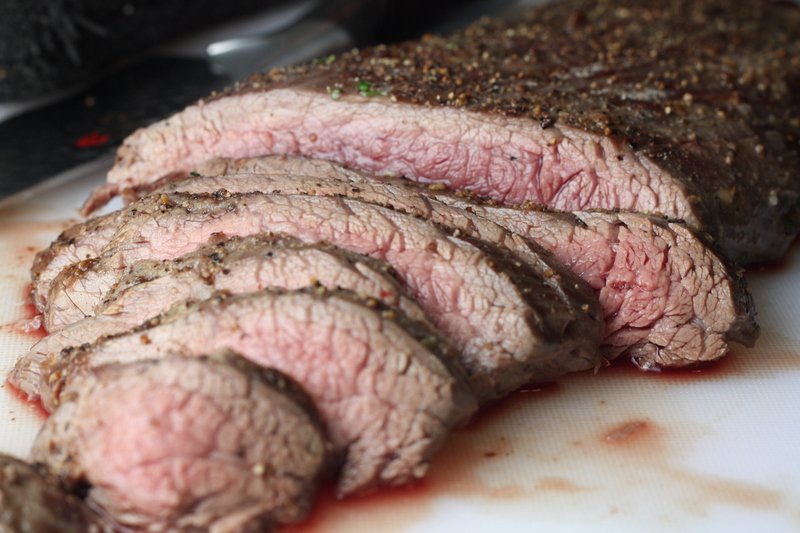 Allow the steak to rest for 5-10 minutes before slicing. For the reduction, combine pomegranate juice and balsamic vinegar in a saucepan. Bring to a boil. Continue boiling until the mixture has reduced by 3/4. Spoon the warm reduction sauce over your cooked slices of steak. Bring a large pot of water to a boil. 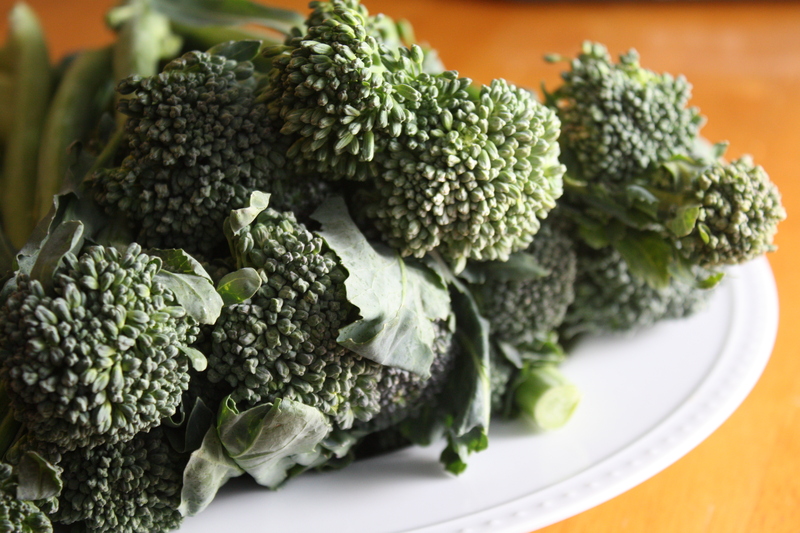 Insert the broccoletti and simmer for 3-4 minutes. Strain. In a large pan, heat olive oil over medium heat. Add the minced garlic and cook for about 2 minutes. Add the broccoletti to the pan and toss in the olive oil and garlic. Season with salt and pepper. Preheat oven to 425 degrees. 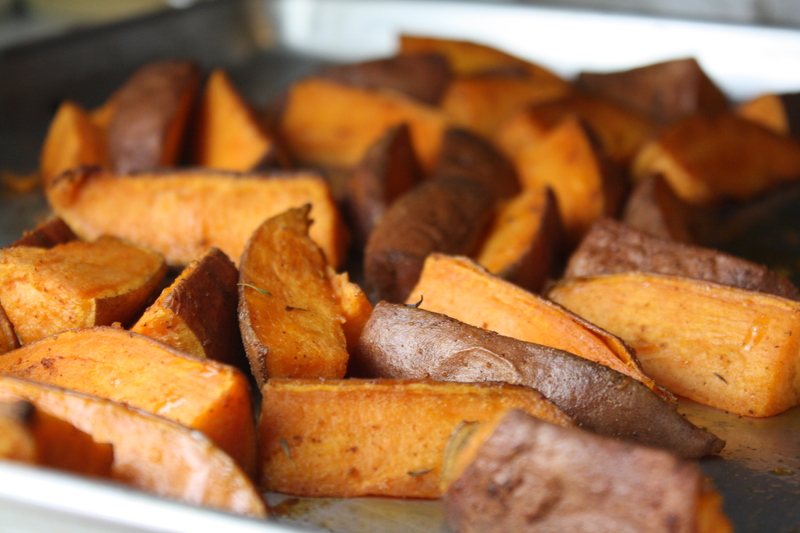 Thoroughly wash the sweet potatoes and cut in half across the middle. Place in a microwave safe bowl and cover with plastic wrap. Microwave for about 5 minutes. The potatoes should still be quite firm at this point. (Microwaving the potatoes for a few minutes will help to reduce the roasting time and makes the potatoes softer and safer to slice into wedges.) Allow the potatoes to cook for a minute, then slice each potato half into wedges. Toss the wedges in olive oil until well coated and season with cajun seasoning. Arrange the wedges in a single layer on a large baking sheet and bake for about 30-35 minutes, until tender and lightly browned. Posted in Beef, Dressings and Condiments, Food, Main Course, Potato, Recipes, Sauces, Side Dishes, Vegetable and tagged beef, Cooking, dogs, Eating, Food, food photography, Recipes, steak, sweet potatoes, vegetables. Bookmark the permalink. oh my gosh! all of this looks absolutely incredible. and the photos of the steak make me really want that right now. maybe ill have it for dinner. thanks! What a truly decadent meal – YUMMY! I have never thought of combining pomegranate juice and balsamic vinegar before – genius! I love that steak! I actually have all the ingredients on hand and this will be on our menu for the next week. My daughter would eat steak every night if she could. What an adorable lab disposal! We just lost our sink disposal as well… the guy came to replace it and the bottom was actually rotting out. We replaced just in the nick of time. What a difference a new one makes!! This looks like a great meal. Id really like to try that pomegranate reduction.